Because you deserve something special, indulge yourself in this rich nourishing, revitalizing and long lasting moisture treatment that will leave the skin glowing and feeling smooth, soft and hydrated. 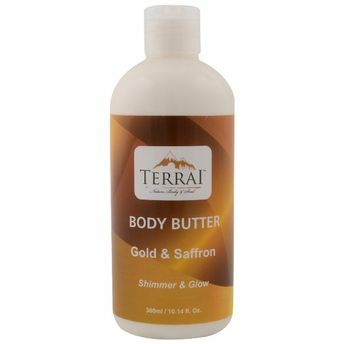 Terrai Gold & Saffron Body Butter is an ultra-luxurious deep moisturizing cream, made with 24 karat Gold dust and Saffron, blended with nature's best moisturizer - Shea Butter. The magnificent blend of 24 karat gold and Shea butter helps reduce signs of aging while adding deep moisture and protection to the skin.